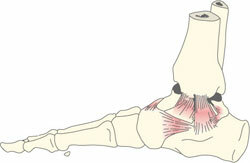 Sprains are frequent and often occur in connection with sport activity. The bigger the twist of a joint the bigger the is risk of a serious sprain. A sprain can in principle occur in all joints including a joint capsule but sprains occur most often in ankle, finger and knee joints. blue, yellow and black, and resulting in pain which can be severe. A joint consists of two or more cartilage clad bone ends that can move relative to each other within a joint capsule. This may be surrounded by reinforcing ligaments. If the two bone joint surfaces are forced apart suddenly but then return to the normal position the excessive ligament pull, may damage the ligaments and joint capsule which is called a sprain. When a ligament/tendon is damaged there will be internal bleeding around the injury. In severe cases, the ligament might be torn apart completely which is called ligament rupture, or there might be a bone fracture in connection with the incident. An excessive or unnatural movement of a joint resulting in a sprain is felt very clearly. There will be pain in the area and the joint will swell and there might be impaired joint mobility in part due to pain and in part due to swelling. You may experience a feeling of lack of control, instability and slack in the joint. The internal bleeding will show up as redness and swelling and later as blue yellow and black discoloration of the skin. If the ligaments ruptured, or at the same time there is a bone fracture the medical examination may show slack in the joint and possible faulty position of the affected joint. Someone with weak joints and a propensity for sprains might find it appropriate to use a supporting elastic bandage or sports tape in connection with sport activity. Obviously it is important for such persons to avoid overloading the joint or push it towards its outer limits and avoid twisting the joint. After sprain injuries rehabilitation is important (see treatment below). The diagnosis is often made from what has happened, the joint appearance and the patient's expression of pain. It can be hard to see if there simultaneously is something broken, and therefore an X-ray of the joint will usually be taken. This may also prove or exclude a joint mal position. There can sometimes be a need for a MRI scan or an arthroscopy using a endoscope (a viewing tube) to see if the ligaments are intact, for example in connection with a knee cruciate ligament injury. Rest: for the ligament/tendon and joint capsules to heal, it is important not to use the joint. Pain will often put a natural end to too much activity. Ice: to counteract the bleeding and swelling, it is important to wrap an ice-pack around the joint. Ice may initially also help soothe the pain. However, it is important not to put the icepack directly onto the skin, but to have a tea towel or similar between the icepack and the skin to avoid frost bite. The maximum duration use of an icepack is 20 minutes per hour. As long as there is pain when resting ice may help. Compression: in the form of an elastic bandage to counter swelling and provide support for the unstable joint. Elevation: of the damaged part above the hart position to minimize the blood supply to the damaged joint which will help prevent swelling and bruising and ease the pain. You can slowly begin to use the joint when the pain has subsided. If there are signs of a major sprain, or is the worst pain not over after a few days, you should consult a doctor for a thorough examination, if necessary with X-ray, to exclude fractures. Depending on which part is sprained, there are various supportive bandages or splints to relieve and support the joint. In severe sprain cases, it may be necessary to plaster the joint to give it rest. Surgery might be necessary if the joint capsule, or the ligament, is torn apart. After surgery the joint is immobilized with plaster for several weeks followed by supportive bandaging and physiotherapeutic rehabilitation can begin. Your doctor may prescribe a non-steroid anti-inflammatory drug (NSAID) that relives the pain and help reduce swelling. For example: Ipren or Ibuprufen. Rehabilitation is very important to recover from a sprained ligament. Bungee training or training on the seesaw board can help rebuild the ligaments natural functions and prevent unnatural movements in the joint. Any sprain can cause collateral damage to joints and adjacent bones. A sprained ligament might become slack and there might be risk of recurrent sprains of the same joint. Unnaturally wear (such as repeated sprains) on the cartilage-clad joint surfaces will ultimately lead to the development of osteoarthritis in the joint.